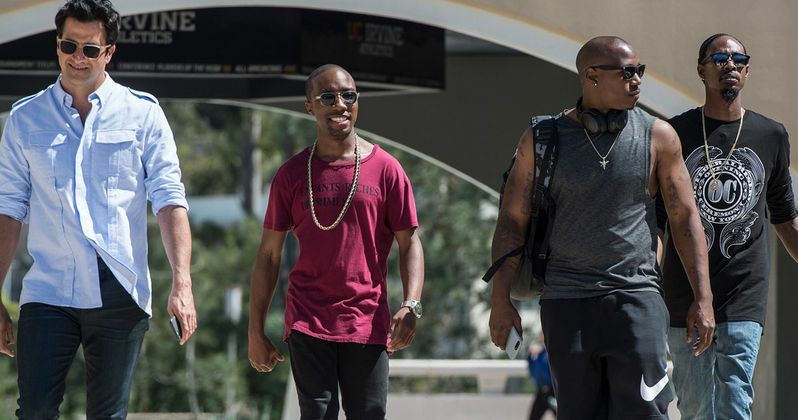 In last week's Ballers epside, we left off with Spencer Strasmore (Dwayne Johnson) being given a sort of subtle warning to back off of his plan to bring a pro football team to Las Vegas, because the NFL itself doesn't want it to happen. Now we will get to see what he chooses to do about that in Ride and Die. But first, I want to talk about Ricky Jerret (John David Washington) since something finally developed! After the roses he sent his baby Mama (Brittany S. Hall) get rejected and sent back to him, he decides to send them again, but he'll deliver them himself. What he discovers is a moving truck outside her place, because she is leaving, and without him. Turns out Ricky isn't as liked by this particular woman as much as he thought she was. Amber tells him that he's getting old, and only has a couple of years left before he is all washed up. And she has no interest in a guy with so little going for him. This realization hits Ricky so hard that his face looks frozen, as if he just got KO'd on Mike Tyson's Punch Out! In addition, he's dealing with the fact that several of his teammates on the Patriots are already practicing without him and he feels left out, so he tries to create some practices for himself. The only problem is he has little success trying to find anyone with enough talent to help him out. Okay, now let's catch up with our main man Spencer, who actually is having a video chat with Chloe (Serinda Swan) because he's at the fertility doctor and he needed some "inspiration" to give a sample. I will just take this moment to appreciate the return of Serinda Swan and how even one episode without her was too much. Back at the office, Spencer and Joe (Rob Corddry) are going over what this verbal threat means, and while Spencer speaks to treading lightly, Joe knows him better than that, and they both agree that they won't let this little scare stop them. Before they can map out more of a strategy, Joe gets a call from the Dallas Cowboys owner. who they simply call "Bossman" (Christopher McDonald). "Bossman" is very upset over Vernon (Donovan W. Carter) using his endorsement money to buy a marijuana grow house AFTER he told Joe to take him out of the weed business. Well, now he's upset to the point where he says he's cutting Vernon from the team, so Spencer and Joe have to go do some emergency damage control and try to get him to change his mind. They do know that these guys from Texas don't mess around, right? Over at the Miami Dolphins camp, Charles (Omar Benson Miller) is trying to convince Larry Siefert that they should bring Kisan Teague (Kris D. Lofton) over to the team because he would be a really valuable asset. The only problem for Charles is that Siefert doesn't like Kisan because of all the off the field problems he keeps having. But because he's a good agent, Jason (Troy Garity) calls in while they're meeting and his pitch convinces Siefert to give him a shot. While Charles is irritated at his boss, he lets it go in the interest of being right about Kisan's ability. They have him work out and run drills for the head coach (Peter Berg) and to the delight of Charles and Jason, the coach likes him enough to want him for the team. While Charles is full of joy over this, he looks over at Mr. Siefert, who just gives him a disapproving frown and walks away. When he confronts his boss, Siefert tells him that he still doesn't want Kisan, because he doesn't trust him. Charles gets defensive and calls him out, citing his ego is getting in the way of a good player. This does not sit well with Siefert at all and he probably tells Charles off before walking away. It was a really fun choice that the writers made to have the two separate stories of Charles and his front office job to cross paths with Jason and Kisan teaming up in this episode. Hope they find a way to keep this going somehow. Back over with Spencer n' Joe "Rescue Rangers", they are zooming over to meet with "Bossman" but they also have to worry about a meeting they have set with Wayne Hastings Jr. (Steve Guttenberg), and he is not a patient man. When they make it to the hotel that "Bossman" is spending his vacation at, it's all about trying to schmooze him up right away, but he has a bone to pick with Spencer that he wasn't aware of. He knows of Spencer and his trying to get a team to Vegas, and he's not happy about it. So now they have two problems to fix! Later on, we cut to Spencer and Joe stuck in traffic, and when you have big stress on your mind sometimes the big truths can come out. Spencer confides to Joe a story about his father and how the man had wished he had tried harder to succeed. Spencer has that drive to achieve the goals he wants to accomplish, and he doesn't want to have any regrets from not trying. The scene is simple and very heartfelt from a show that sometimes forgets the inner human emotions of its characters. Eventually, they make it to seeing Hastings, but he's on his way out since Spencer was so late. But, like the theme of the show has been of this season Spencer pulls an Ace card out and tells Hastings how the owner of the Dallas Cowboys wants to meet with him in an effort to join in on moving a team to Vegas. When two big rich businessmen want to talk to collaborate on making more money, it's going to happen. The best part of this episode was the fact that from the very start, Joe and Spencer were working together and that is what the true foundation of this HBO show is.